Nfansu is a primary school teacher-in-training from The Gambia and the breadwinner for his extended family. Due to an injury, he had to stop work and postpone his education, which meant he could no longer earn to provide for his family’s needs. Nfansu began his journey to Libya in 2016, to seek a better future for himself and his family. Nfansu went to Libya via Mali and Algeria, stopping to work occasionally. At the beginning of his journey, when he was transiting Gao, Mali, it was very dangerous because of the ongoing conflict there. He decided to stay in Gao for only a few days before smugglers took him to Timiaouine, across the border in South-Western Algeria. Nfansu had to walk for three days in the sandy and dusty desert without food or water to get there. When he reached Timiaouine, rebels captured him and held him and some other migrants in a car for a whole week. When he and some of the other migrants finally escaped, they decided to travel on foot further inland, to Tamanrasset. They had been told that they could walk there, but they realised that it was very far away. Luckily, on the way, they found some people laying a road. Nfansu and the others explained what had happened and their unfortunate situation. The workers were sympathetic; they gave them food and water and invited them to camp there with them. The group slept there in the camp with the workers, by the side of the road, and then in the morning they arranged a vehicle the rest of the way to Tamanrasset. In Tamanrasset, Nfansu decided to stay and work there during the final months of 2016, to save money to continue his journey to Libya. He used this money to pay smugglers to travel in a pickup truck with a large group of others. They drove Debdeb, at the border with Libya which took two days because they had to take alternating routes to avoid any interactions with the police. The journey was extremely long and uncomfortable. 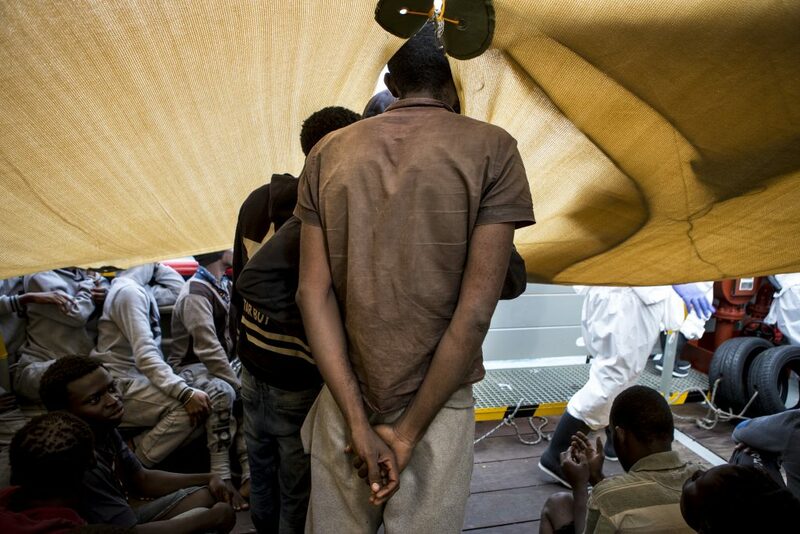 Nfansu was squeezed onto a pickup with many other migrants. It was cramped, hot, and airless; he saw two boys collapse on the journey. During the first couple of months of 2017, Nfansu stayed in Debdeb but then he travelled to the coastal city of Sabratha in Libya without stopping because he knew he could travel onwards to Europe that way. Once in Sabratha, he lived in an overcrowded warehouse on empty land by the sea, owned by smugglers. He lived alongside many others from Sub-Saharan Africa, including Senegalese, Gambian, Malian, and Togolese migrants. During this time, he was not allowed to go outside the warehouse except for occasional work when residents from the surrounding villages would come and take him to work in construction. I would not advise anybody to use that route because of what I encountered there. I would not like my fellow black man to enter there. When your money is finished, it’s finished, they will not care for you; if there is no food, they will not feed you; if you are thirsty, they will not give you water; even if you are sick, they will not get you medicine…unless you find someone from the same place as you and who is sympathetic toward you and helps you.